Money to purchase vaporizers, which allow patients to inhale the active ingredients without the need for smoking, is being raised by the Israel Association for the Advancement of Medical Cannabis. Five vaporizers are already in use at the hsopital. 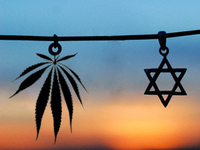 Israel, along with Holland, Germany, Canada, and 13 American states, is one of the first countries to legalize the medical use of marijuana. Sheba Medical Center is one of the first hospitals in the world to adopt a protocol to regulate the clinical use of the herb, according to Haaretz.com.